Nora says: "Hello! 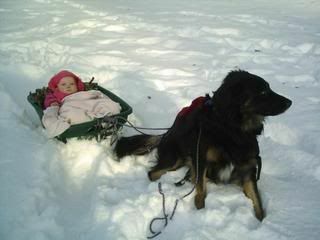 I have everything I need, but I think my sled dog is on Strike!" 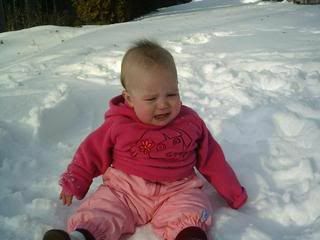 Nora Says: "It's too Cold!" 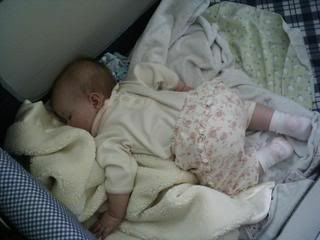 Nora Says: "I love the blankies...zzzzzzzzzzzzzzzz"
Save your Children! We NEED to eat Organic! Jen Bove introduced me to "The Story of Stuff" http://www.storyofstuff.com/ and while I watched this FANTASTIC movie, I was shocked to learn that breastmilk- you know the stuff I have been feeding my daughter for the last nine months- is considered the most contaminated human food! Now, of course Breast Is Best, but it shocked me and I wondered why I didn't realize this before. So I started looking into this a bit more and found some amazing articles that I think every woman and especially every mom should read! Let's educate ourselves and get those contaminents OUT! Get rid of carpets and other fabrics that out gas into the environment. Write letters to the government letting them know that it is NOT okay to poison us and our children. More Snow last night! And more on the way tonight. If you requested that I add your blog or etsy as a link on this blog, and it hasn't happened yet, I apologize. I have been out sick with a miserable, no good, very bad head cold since Sunday. I will try and get all caught up this week. Since I have been sick, and it has been snowing so much, Doug (my husband) has been walking the 2 miles to work and then another 2 miles home each day. Needless to say it is good exercise for him, but when I needed to use the car this morning- I was snowed in! I had to scrape a foot of snow off the windshield, the hood, the trunk and a sheet of ice off each window. Not only that, but we live on a hill and our car does not yet have it's snow tires on. So I could not get any traction going up the hill. So instead I reversed out of the parking spot and went the long way to work. I had to drive through town instead of skirting around it. Good thing I left an extra 15 minutes early. Nora wasn't too pleased with the extra long car ride, but overall it was a nice drive. Everyone was driving slow and careful which was nice to see. I was watching the weather channel this morning since I become obsessed with weather during the winter months. I saw that the Southern States have tornado warnings! Yikes! I don't ever want to live ANYWHERE that has tornado threat. I have always been very lucky in that respect. I will take massive amounts of snow and rain anyday over tornado and hurricane concerns. Good thing I want to live in the Montana/Wyoming area then, eh? Speaking of which, the move to Montana is becoming more and more certain everyday. I really am going to miss the Palouse. It took a few years for this area to grow on me, but now that I know more people, it will be so very hard to leave. But I feel a certain joy in my heart each time I think of being able to go see my family whenever I want to! Yay! I know the decision is a good one. Just please keep those good thoughts, prayers, whathaveyou's coming our family's way. We really are hoping that the universe has lined up good jobs so that we can be successful and get settled. While I was sick and at home with Nora, I decided it was time to teach her a new skill. She now knows how to "High Five" though she isn't very consistent with it. She has to be in the right mood. However, teaching her how to high five has reminded her how to clap, so we are seeing a lot more of that now. So cute. I will try to get a video of it tomorrow. I just need to remember to bring the camera with me. Not much else is going on. I am ALMOST finished with MaryJane's Christmas present. Yeah, I know- Almost a month late. I did have some people who only recently got me their patches though, and I know MJ will love it whenever I get it to her (SOON!). :D I will post a picture of it as soon as I have given it to her. If any of you haven't ever visited MaryJanesFarm either in real life or virtually- you should! If you are reading this blog, I KNOW you will find something love over there. And MaryJane herself is as real and true to life as she seems in her magazines and books. She is petite and beautiful and completely true to herself. I was amazed when I first met her and realized she was short like me! I am 5 foot even and she is probably only an inch or two taller. For some reason, I had always thought she must be at least 5'6"! MaryJane and my mom could be sisters, they are both so kind, loving, and creative. And for those of you who know how much I love my mom- I hope that gives you an idea what MaryJane is like. I just went and peeked in on Nora. She is sleeping in the other room. She is fast a sleep and lying about 3/4 of the way onto her side. 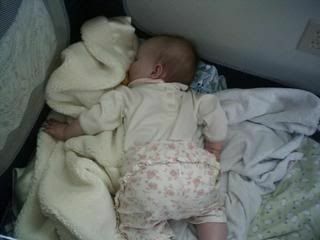 When I laid her down, her arms sprawled out to either side and since then she has tried to roll over a little bit. One of her hands is not resting on her forehead- palm out Scarlett O'Hara fashion. I SO wish I had brought the camera out. While I was sick I worked on making new diapers for Nora. Since she is crawling/cruising so much now, I decided to go ahead and make the next batch of diapers into contoured diapers. They are pretty easy once you have done it a time or two. I use the Mamabird diaper patter, and have been re-using the old flat fold diapers as soaker pad inserts. I am using 1/4 inch elastic and that seems to be just strong enough to hold in the solids but not so strong that it leaves marks in Nora's skin. One of these days I will take pictures as I make one in case the helps anyone else who wants to try. The college decided that I did not show enough fore planning and forethought in submitting my petition. Needless to say, I am pretty sad and disappointed about all of this. I do have one last chance- a chance to petition the petitions committee. Otherwise I am out of school until summer session. I might end up going to summer session and taking a heavy course load right up until the day we move. Ugh. This will make for a very miserable summer and we might have to beg our landlords to extend our lease for a month and a half so I can attend school. So right now a whole deck of cards just got thrown into the air and I am just waiting to see where they land. Yesterday, Nora and I dashed out to the horse ranch to take my frustrations out on horse manure. It's amazing how some good old fashioned hard labor can put a new perspective on things. We had a wonderful day and it always feels good to help friends out and lighten another person's load. Nora is going to be walking soon so I am already starting to think ahead to the next stage of her potty training. I want to buy a training potty, ( I will probably buy one from the consignment store) and sit Nora on it when we play games like Patty Cake, Itsy Bitsy Spider, Twinkle Little Star, ABC's with Finger Spelling and so on. I will keep her happy to be in one spot hopefully until she potties and then she will get praised and told how wonderful she is. I know she is really young yet (only 9 months) but I figure that if she is exposed to the potty chair now, and gets rewarded for using it now, then as she gets older and decides to use it herself it will make potty training easier. Who knows- I might get a potty trained one year old out of the bargain! 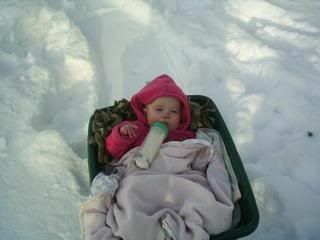 The only downfall I can see from this plan is that one of her first words is going to be "Potty!!" More later, my friends. Nora is starting to protest being awake. (Obviously this is a horrible ordeal that I have concocted just to torment her ;p ) So I needs must go and help her off to dream land!